The Source Four LED line is the result of the marriage of the Source Four and Desire product lines yielding the control of a Source Four with color control of the Desire fixture. 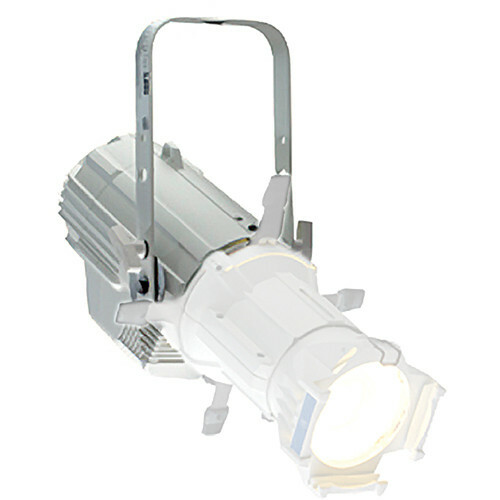 This ETC Source Four Lustre+ LED Light Engine without Lens or Shutter Barrel (White) - 100-240VAC is comprised of the light engine only. It is intended for those who want to retrofit an existing fixture. There is no shutter barrel on the engine. It is compatible with zoom lens tubes only and requires one for use. Lustr+ fixtures utilize an exclusive x7 Color System which allows blending of the 7-color LED array to render an extremely broad range of colors, subtle hues and theatrical tints. The Lustr+ is especially complementary to skin tones. Other benefits of the series are multiple control options via DMX, multi-voltage operation and long (50,000 hour) lamp life. Thermally insulated rear handle, knobs and shutter handles make handling and aiming easier; gels, patterns and shutters last longer, and your performance space stays cooler. Die-cast aluminum construction, 20 gauge stainless steel focusing shutters. Box Dimensions (LxWxH) 23.0 x 20.0 x 13.0"